This past Tuesday, the Children’s Center Rehabilitation Hospital on NW 39th Expressway in Bethany had the dedication of their new patient bed tower. The new tower offers four floors that will include the pediatric outpatient clinic, treatment and diagnostic rooms and an additional forty patient beds. The dedication was held in the new building and several of the board members gave speeches. A ribbon was cut by a couple of former TCCRH patients, and then everyone was encouraged to take a self-guided tour of the new facility. 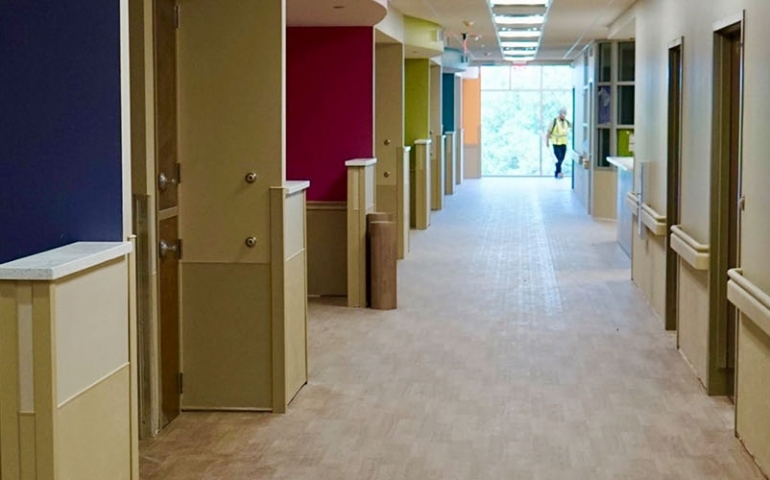 Planning for the hospital addition began back in 2013 with the “Imagine the Miracle” campaign, and over $20,000,000 were raised to complete the construction of the new building, $2,000,000 of which was raised by the hospital’s employees. David Lopez, former Secretary of State, made an appearance for the governor of Oklahoma to perform the dedication and read the proclamations to make the event official. The Children’s Center Rehabilitation Hospital has been around since 1898 when Mattie Mallory started it as an orphanage for children in Oklahoma City. What began as an orphanage is now a specialized pediatric facility that is one of the only ones in the country of its kind. The sub-acute care offered at The Children’s Center’s 24/7 nursing care for children who need constant medical observation and treatment is something that is unique to this particular facility. Mattie Mallory was also a Christian and she felt like opening The Children’s Center was God’s calling in her life. She believed that the mission of the hospital was to serve in faith, hope and love. To this day, the hospital bases its mission statement on the founding principles of Mattie Mallory. “The Children’s Center is so much different from other hospitals around the country because you can feel the love of Christ truly flowing in that hospital,” stated Grimaud. If you are interested in learning more about The Children’s Center Rehabilitation Hospital, visit miracleshappenhere.org.